inviting people into a conversation with God. Over many years our 7pm congregation has been worshipping God and growing as disciples of Jesus, but over the last few years the number of people attending this 3rd Sunday service have declined. Although our fellowship is deep and joyful, often there’s been only a very small number of people attending the worship service on a Sunday evening at 7pm. The elders and members of the evening congregation long to see the gospel impacting the lives of people in our community and we’ve been thinking about how we can be most compelling in directing people to God. It’s for this reason that today we’re announcing some big and exciting changes. Firstly we’re changing the time of the service from 7pm to 5pm. This will allow more people to attend who don’t like being out after dark. It will allow families to attend before their kids have to go to bed. It will give us an option to fellowship over a meal after the service. Secondly we’ve got a tag line and logo about conversation. One of the distinctive features of the evening service is its interactive nature and less traditional format for worship. We regularly have times of open prayer and we encourage questions and discussion as part of the service. We want to enhance and promote that. Some of you may be thinking that having a conversation with God sounds a bit disrespectful, but in fact we do this in all our services. When we read the Bible God speaks to us, and when we pray we literally speak to God. The evening service is, and will be, less formal than our morning services, but worshipping God will still be what drives us. Finally, we’ve got a new name: REVIVE @5. 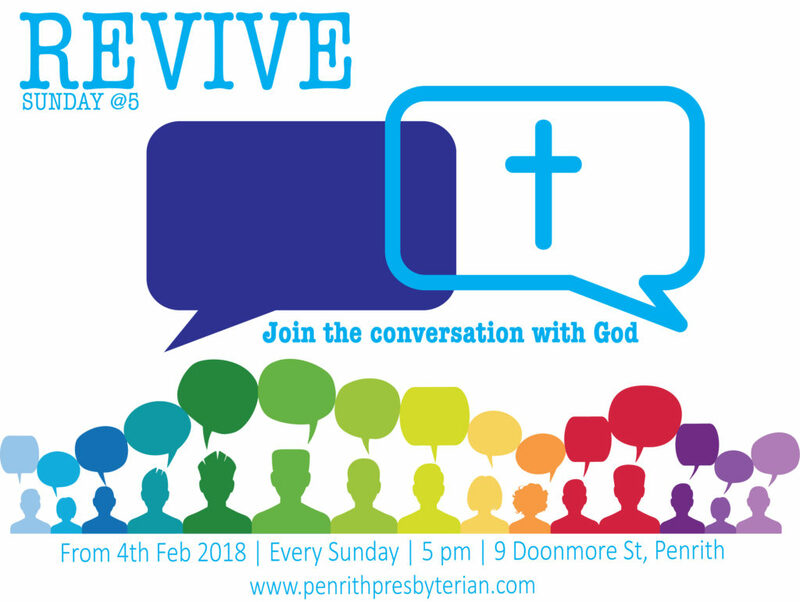 The word “REVIVE” beautifully describes what we’re hoping to do with the evening service, but more importantly, ‘REVIVE’ describes what the result of a conversation with God should be. God uses his word to transform and revive our souls. It’s our prayer that this service will be a channel for that. ~ Hugh Prattis, Assistant Minister.